From the Department of Medicine (M.J.B., G.D.G., A.G.), University of Auckland, New Zealand; and Health Services Research Unit (A.A.), University of Aberdeen, Foresterhill, Scotland. Background: Statistical techniques can investigate data integrity in randomized controlled trials (RCTs). We systematically reviewed and analyzed all human RCTs undertaken by a group of researchers, about which concerns have been raised. Methods: We compared observed distributions of p values for between-groups differences in baseline variables, for standardized sample means for continuous baseline variables, and for differences in treatment group participant numbers with the expected distributions. We assessed productivity, recruitment rates, outcome data, textual consistency, and ethical oversight. Results: The researchers were remarkably productive, publishing 33 RCTs over 15 years involving large numbers of older patients with substantial comorbidity, recruited over very short periods. Treatment groups were improbably similar. The distribution of p values for differences in baseline characteristics differed markedly from the expected uniform distribution (p = 5.2 × 10−82). The distribution of standardized sample means for baseline continuous variables and the differences between participant numbers in randomized groups also differed markedly from the expected distributions (p = 4.3 × 10−4, p = 1.5 × 10−5, respectively). Outcomes were remarkably positive, with very low mortality and study withdrawals despite substantial comorbidity. There were very large reductions in hip fracture incidence, regardless of intervention (relative risk 0.22, 95% confidence interval 0.15–0.31, p < 0.0001, range of relative risk 0.10–0.33), that greatly exceed those reported in meta-analyses of other trials. There were multiple examples of inconsistencies between and within trials, errors in reported data, misleading text, duplicated data and text, and uncertainties about ethical oversight. Conclusions: A systematic approach using statistical techniques to assess randomization outcomes can evaluate data integrity, in this case suggesting these RCT results may be unreliable. Meta-analysts may identify concerns about data integrity during their careful review of large numbers of publications. While undertaking systematic reviews in osteoporosis, we considered RCTs by Yoshihiro Sato et al. (“the researchers”) for inclusion. This group of authors has published a very large number of RCTs (appendix e-1, table e-1A, references A1–A33 at Neurology.org) that collectively have substantially influenced relevant systematic reviews. Dr. Sato is the first author on 79% of these trials and holds primary oversight of the majority of these publications. Questions had been raised in journal correspondence regarding some of these papers,3,–,7 and we had additional concerns about aspects of a number of papers identified for our reviews. We wondered whether the statistical techniques previously used for comparing distributions of baseline variables2 could be applied to a systematic review of RCTs from the researchers that included 3 papers published in Neurology® (A9, A17, A23, which have been retracted; for a full list of papers in this study retracted to date, see table e-1B.). In addition, we assessed some other potentially relevant aspects of the body of RCTs including the researchers' productivity and recruitment rates, outcome data, textual consistency within and between RCTs, and ethical oversight. In November 2012, we searched MEDLINE and Embase for all RCTs with Y. Sato or Yoshihiro Sato listed as an author, published in English or Japanese. Two hundred fifty-three potentially relevant publications were identified. After excluding unrelated articles and articles by other individuals with the same name, we identified 33 RCTs in humans (table e-1A). For each report, we extracted data on study design, ethical approval, randomization, baseline characteristics, and outcomes, and identified inconsistencies in reporting of methods and results. Halbekath et al.6 suggested that “baseline data indicate that the study groups are strikingly well matched” in many RCTs reported by the researchers,6 who responded that this occurred “not by design but by chance.” Since allocation of participants in an RCT is random, comparisons between randomized groups for independent variables at baseline should produce a uniform distribution of p values; for example, there is an equal likelihood of a p value of <0.1 and >0.9, of <0.2 and >0.8, etc. Baseline variables within an RCT are not always independent and may be correlated. However, this interdependence is unlikely to translate into substantial between-group similarities where simple randomization is used. Clustering of the p values for differences between groups may not occur in the same direction or to the same degree in other trials. Since any differences between groups are attributable to chance, if there is consistent clustering of variables in multiple trials, the distribution of p values across multiple trials from a group of clustered variables should still be approximately uniform. Therefore, across a body of RCTs, clustering is unlikely to affect the distribution of p values markedly. We compared the observed distribution of p values in deciles for all baseline comparisons with the expected distribution using the χ2 test (Excel 2007; Microsoft, Redmond, WA). We used reported p values from the papers, and when these were not reported, we calculated p values from the reported summary data (mean, SD, or percentage) using t tests or 1-way analysis of variance for continuous variables and χ2 or Fisher exact test for categorical variables (OpenEpi version 2.3.1, www.OpenEpi.com). We assembled a dataset of 13 RCTs8,–,20 conducted by the Auckland Bone and Joint Research Group (table e-2) as a matched control group of trials that were similarly sized to the RCTs of interest, conducted over a similar time frame, and also focus on the prevention or treatment of osteoporosis in older people. We compared the distributions of p values and standardized sample means between this control dataset and the dataset of interest. Bootstrap resampling was used to account for ignorance of the dependence structure between differences in baseline variables and single group variance structures. We randomly selected between 350 and 450 baseline p values (with replacement) and between 250 and 350 baseline standardized sample means (with replacement) from both datasets, performed 2-sample Kolmogorov–Smirnov tests on these values (SAS v9.4; SAS Institute Inc., Cary, NC), and repeated this 1,000 times. In a trial with simple randomization, the proportion of participants in each group is determined by chance, and thus the numbers of participants in the randomized groups in a set of trials will be binomially distributed.21,22 For a 2-arm trial with 2 participants, the probability of equal number of participants in each group (i.e., one) is 50%, for 4 participants is 37.5%, for 10 participants is 25%, and for 50 participants is 11%. 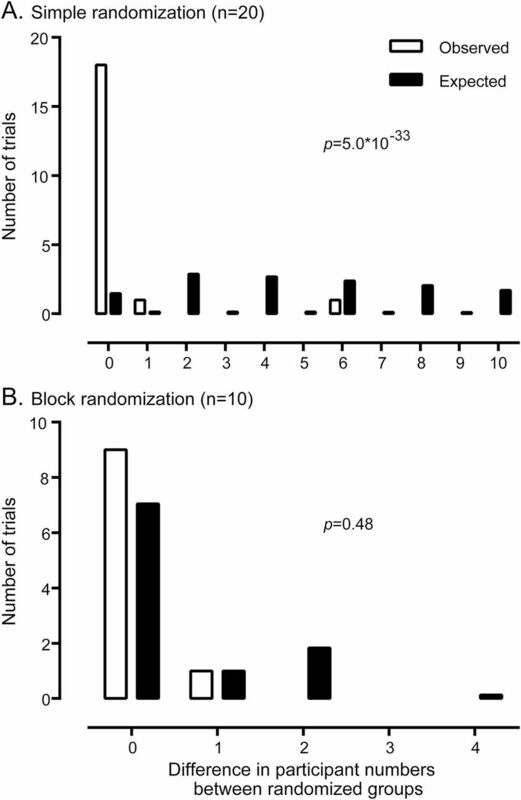 For block randomization, the number of participants in each trial arm is equal in each block. Thus, any differences between the size of randomized groups arise from the last block. If the block is filled, the groups will be equal in size. For a block size of 2 or 4 in a 2-arm trial, an odd number of total participants means the groups differ by one. For a block size of 4, 2 participants in the final block gives a 2/3 probability the groups are equal in size, and a 1/3 probability that they differ by 2 participants.22 When block randomization is stratified, the same principle applies for each stratum. We used the approach of Carlisle2 to assess whether the distribution of differences in numbers of participants between treatment groups in the trials conducted by the researchers is consistent with the binomial distribution. Hip fracture was the most frequently reported fracture outcome, reported for 23 trials. Using random-effects models, we pooled these outcome data from trials by the researchers and compared the results to published contemporaneous meta-analyses of trials from other investigators. Statistical heterogeneity between trial-level summary data was assessed using the Cochran Q statistic (p < 0.10) and the I2 statistic (I2 > 50). Analyses were performed using Comprehensive Meta-Analysis version 2 (Biostat, Englewood, NJ). Table 1 shows the characteristics of the 33 human RCTs (A1–A33). Of note, these 33 RCTs were published over a 15-year period and included 5,894 participants. Three (A9, A17, A23) were published in Neurology. Y. Sato was the first author for 26 RCTs. Another author was the first author for the remaining 7 RCTs and a coauthor for 25 RCTs, and 3 others coauthored at least 10 RCTs. The rate of publication of RCTs suggests a very large well-funded research network, with access to a very large catchment of patients with substantial comorbidity who, nonetheless, are willing trial participants. Considering these practical requirements, it was surprising that there was no statement regarding funding for 30 of the 33 human RCTs. Furthermore, none of the RCTs contained a statement on trial registration, although many trials were published before this became customary. The human RCTs represent remarkable productivity, particularly given the frailty of the participants in several of the trials. For example, in the 5 months between March 2003 and July 2003, the researchers recruited 500 ambulatory female patients older than 70 years with Alzheimer disease living in the community in 2 months (A18), 280 male patients older than 65 years with hemiplegic stroke in 2 months (A15), and 374 female patients older than 65 years with acute hemiplegic stroke in 4 months (A17). Compounding the workload of recruiting for these 3 trials, participants were also reviewed every 4 weeks, and during this period, there was also ongoing intensive follow-up in 3 trials involving 774 participants (A13, A14, A20) and recruitment and intensive follow-up for 2 other trials involving 292 participants (A11, A23). Despite the high workload required to conduct clinical trials on such a scale, 4 of these 8 trials listed only the same 4 coauthors (A14, A15, A17, A18), and only one additional coauthor was listed for 2 of these trials (A13, A23). However, the recent Journal of Bone and Mineral Research retraction notice for one paper (A16) states that the coauthors of Dr. Sato “are named as such for honorary reasons and are not responsible for the content of the manuscript.”23 Two of the 3 papers in Neurology reported details on potential participant eligibility. In one, <10% of potential participants were ineligible despite very restrictive inclusion criteria (A9). In both, >85% of people approached were enrolled (A9, A23). Improbably similar randomized treatment groups. In 32 human RCTs, baseline data for all participants in all randomized groups were presented for 513 variables; data were only presented for study completers in one RCT (A1). Figure 1A shows the distribution of p values for between-groups comparisons of these 513 variables. Of note, 52% of p values were >0.8, while only 6%, 14%, and 27% of p values were <0.2, <0.4, and <0.6, respectively. This distribution is highly unlikely to have arisen by chance (p = 5.2 × 10−82). In the 25 RCTs with Y. Sato as the first author, the distribution of p values differed significantly from the expected distribution (p = 3.8 × 10−100) (figure 1C). Figure 1B shows the distribution of the standardized sample means for 402 baseline continuous variables. The SD of these standardized sample means was 0.84, and the distribution differed markedly from the expected distribution (p = 4.3 × 10−4), with values clustered more tightly around the mean than expected. Figure 1D shows that in the 25 RCTs with Y. Sato as the first author, the distribution of standardized sample means differed from the expected distribution with values clustered tightly around the mean (p = 1.5 × 10−11). 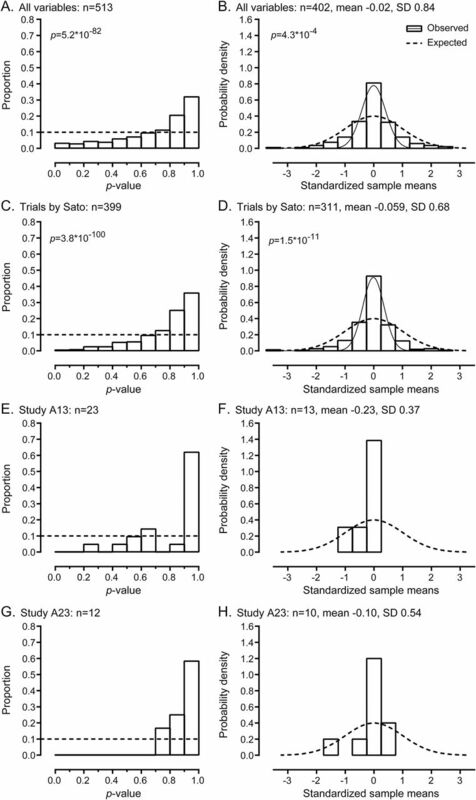 (A, C, E, G) The observed vs expected distribution of p values by decile in 32 randomized controlled trials for all baseline variables (A), in 25 trials with Y. Sato as first author (C), and as illustrative examples, for all baseline variables in study A13, the subject of the recent expression of concern from the Journal of the American Medical Association27 (E), and study A23, published in Neurology (G). The dotted line shows the expected proportion (0.1) for each decile. (B, D, F, H) The observed vs expected distribution of standardized sample means for all continuous baseline variables in these 32 trials (B) and in 25 trials with Y. Sato as first author (D), and for all continuous baseline variables in study A13 (F) and study A23 (H). The expected distribution is a normal distribution curve with mean 0 and SD 1 (dotted line). The solid line is a normal curve of best fit to the observed data. All the graphs show that the observed distribution differs markedly from the expected distribution. The distribution of p values from 918 baseline variables from 13 RCTs in the control dataset was consistent with the expected independent uniform distribution (p = 0.07, figure e-1), and the SD of the standardized sample means from 726 baseline variables was 1.02, also consistent with the expected distribution (p = 0.78). However, comparison of baseline p values and standardized sample means from the RCTs of interest and the control RCTs using bootstrap resampling showed marked differences in distributions (baseline p values: p < 0.001 in all 1,000 comparisons; standardized sample means: median p value 6 × 10−4, 95% confidence interval 2 × 10−7 to 0.021). Table 2 shows that the numbers of participants in each treatment group were the same in 27 of 30 two-arm RCTs. For all 33 trials, randomization in blocks was stated specifically for 10 RCTs, using computer-generated random numbers for 13 RCTs, no details were reported for 9 RCTs, and one trial was pseudorandomized using alternate allocation. Four trials that used block randomization were stratified by site, and for one trial, participant numbers by site were reported in correspondence about the paper (A18). For another 2 trials (A13, A15), stratified randomization was not described, but multiple sites and participant numbers by site were reported in corrections or correspondence about the papers. We assumed randomization was stratified by site for these 2 trials. Figure 2 shows that the distribution of differences in participant numbers between the treatment groups differs from the expected distribution (p = 5 × 10−33) in 20 two-arm RCTs presumed to use simple randomization (i.e., unless block randomization was stated). For the 10 RCTs that used block randomization, the observed distribution of differences was consistent with the expected distribution (p = 0.48). When all 30 two-arm trials were considered, the observed distribution of differences differed from the expected distribution (p = 1.5 × 10−5). Finally, we treated all trials as if they used randomization with a block size of 4 unless another approach was explicitly stated (except trial A1, which has a difference of 6 participants between groups meaning that block randomization is very unlikely). The distribution of differences in participant numbers between the treatment groups still differs from the expected distribution. The expected number of trials with equal participants is 22/30 and with a difference of 2 participants is 5/30, whereas the observed number of trials was 27 and 0, respectively (p = 0.04). The observed and expected distribution of participant numbers between randomized groups in 30 two-arm randomized controlled trials by the researchers. Trial A11, which was pseudorandomized, is excluded from these analyses. (A) The results from 20 trials presumed to use simple randomization, and (B) the results from 10 trials that used block randomization. The results of these separate but complementary analyses strongly suggest there has been a systematic failure of randomization in these trials because the randomized groups are much more similar than would be expected by chance, if randomization had occurred successfully. The outcomes reported by the researchers are generally extremely positive and inconsistent with contemporaneous literature. Despite studying frail elderly individuals with substantial comorbidity, table 2 shows that participant withdrawals from the trials were few in number and very well matched between treatment groups. In fact, only 519 participants (8.8%) did not complete the trials, which is surprising because participants had very high rates of hip fracture (table 2) and substantial background comorbidity, both of which are associated with high mortality. Figure 3 shows the observed reductions in hip fracture in RCTs with a control group that received either placebo or no treatment for the various treatments studied by the researchers. There were consistent and substantial reductions in hip fracture incidence regardless of the treatment studied (relative risk 0.22, 95% confidence interval 0.15–0.31, p < 0.0001, range of relative risk 0.10–0.33) with very little statistical heterogeneity between the results. This lack of heterogeneity is very surprising given the relatively large numbers of agents and the diversity of the populations studied. Furthermore, figure 3 also shows that the magnitude of these reductions is substantially greater than those observed in meta-analyses of other trials for these agents,24,–,26 and the confidence intervals around the pooled result for the researchers' trials do not overlap the confidence intervals around the pooled results for trials conducted by other investigators. Thus, the very positive results of the trials by the researchers are inconsistent with results from other groups. Meta-analysis showing a 78% reduction in relative risk (p < 0.0001) of hip fracture in 19 randomized controlled trials by the researchers with a control group that received either a placebo or no treatment. 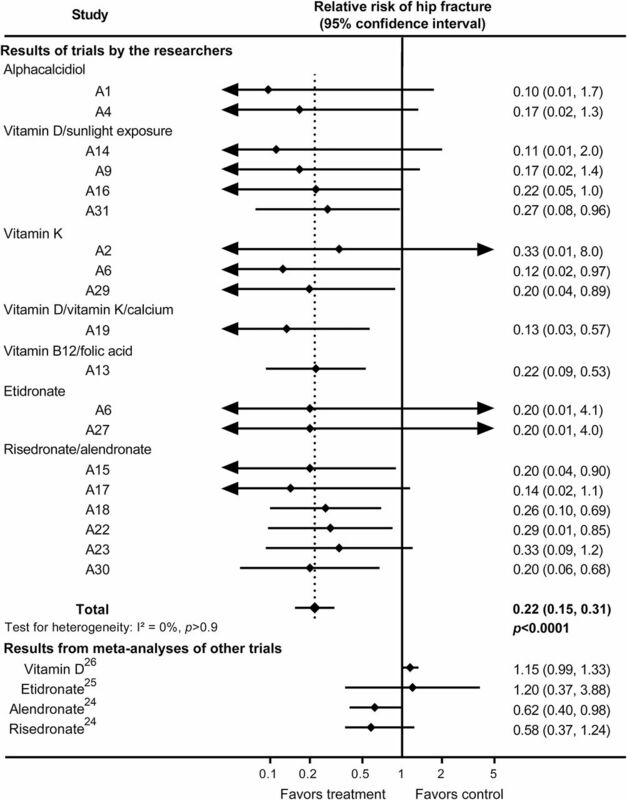 For comparison, the results for agents in meta-analyses of other trials are shown.24,–,26 There are insufficient data for hip fracture outcomes from trials of alphacalcidiol,26 B12/folate, or vitamin K by other investigators, but vitamin K is reported to have no effect on bone density29 or vertebral fracture risk.30 There was a statistically significant (p < 0.05) interaction between the risk of hip fracture in the researchers' trials and the risk of hip fracture for each of the agents in trials by other investigators. There are a number of inconsistent results between trials conducted by the researchers. For example, in a trial in Alzheimer disease (A29), the control group received risedronate and calcium and had a hip fracture rate of 86/1,000 patient-years. Yet, the active treatment arm of another trial in patients with Alzheimer disease (A18) who received risedronate, calcium, and vitamin D had a hip fracture rate of 15/1,000 patient-years. Similarly, trials in Parkinson disease in which the control group received placebo plus vitamin D reported very high rates of hip fracture (49, 37, and 55/1,000 patient-years) (A22, A23, A30) but when sunlight exposure was used as the active treatment arm to improve vitamin D status, the hip fracture rate was only 9/1,000 patient-years (A31). Likewise, when vitamin D was used in the placebo arm of trials, bone density decreased substantially by 0.9% to 3.2% (A18, A22, A23, A30), whereas when sunlight exposure was studied as active treatment, bone mineral density increased by 2.7% to 3.8% (A16, A31). There are also inconsistencies within trials. For example, in one Neurology paper (A9), the authors state that 109 participants were randomized to one group and 108 to the other. However, the participant flow diagram shows 129 participants in each group with 109 and 108, respectively, completing the trial. In one study (A22) it is stated that randomization was performed by one of the authors “(J.I. ),” and in the same paragraph, it is stated that “follow-up assessment of patient's condition was performed by physicians (Y.S., J.I.) who did not participate in the initial randomization.” In one study (A29), it is stated that randomization was stratified by site, yet only one site was mentioned in the methods section. In another study (A15), participants were eligible for inclusion if they had sustained a stroke at least 3 months before the study began, but the mean duration of illness at baseline in both randomized groups was 90 days, or slightly less than 3 months, which appears implausible. There are also errors in the reported outcome data. In 14 RCTs, rates of hip fracture per 1,000 patient-years are reported (table 2). For 11 of these trials, the reported rates can simply be calculated with the equation: rate = number with hip fracture/(participants × duration of trial). These rates are not correct because they do not account for loss to follow-up or censoring of participants who have sustained a hip fracture. Data on adverse events are also misreported. For example, in 2 of the 3 Neurology papers, it was stated that no adverse events (A17) or no serious adverse events (A23) occurred during the trial. However in A17, 10 participants withdrew because of death or intercurrent illness, 87 experienced at least one fall, and 8 had a hip fracture. Likewise, in A23, 7 participants withdrew because of death or intercurrent illness, 12 had a hip fracture, and there was an average of 1.5 falls per participant during the trial. In one study (A13), the researchers claimed to have recruited 628 trial participants from a single site. In a later correction, they stated that there were 3 additional unnamed hospitals and that the originally stated site actually recruited only 53 of 628 participants, the smallest number by some degree. Similarly, in 2 studies (A15, A18), the researchers claimed to have recruited 280 male patients with stroke and 500 patients with Alzheimer disease, respectively, from a single site. In a later correction, they stated that there were 2 additional unnamed hospitals. The researchers stated that the reason for this misinformation was that “these hospitals were reluctant to have their names in the article.” Given the large size and intensive nature of these trials, and the absence of statements regarding funding, we presume the trials were effectively funded by the hospitals involved, with substantial trial input from other unnamed hospital staff. It is hard to understand why the hospital and its staff would not accept any recognition of their substantial contributions. There are examples of strikingly similar text in the reports, including duplicate outcome data. Table 3 shows that the reported mean and SD for fall rates were identical in 3 studies (A4, A6, A9) for both the treatment and control groups, and another study (A19) had identical SD to the earlier studies but the mean differed by l unit for both the treatment and control groups. Later, these data were altered without explanation in corrections for 2 of these trials (A6, A9). Duplicated text is also apparent when logical errors arise. Table 3 shows an example of 2 studies with identical exclusion criteria, but one criterion does not make sense for one trial because it only applies to women, but only men were eligible to participate in the trial. Some examples of duplicated text are extensive. The majority of the text in one article (A16) is identical or nearly identical to that of a later article (A31) (table e-3). In the 33 RCTs, the ethics committee that approved the research was usually listed as the institutional or local ethics committee (22 studies). By using all the published information regarding the ethics committee approval and the location of the study, it appears that ethical approval was granted by the ethics committee of Futase Social Insurance Hospital in 11 RCTs, Mitate Hospital for 10 RCTs, Keiyu Orthopaedic Hospital for 5 RCTs, multiple hospital committees in 2 RCTs, and in 5 RCTs, the committee could not be identified. We searched the internet for “ethics” and “Mitate Hospital” or “Futase” and were unable to identify any studies performed by other groups approved by either of these ethics committees. With only 4 clinicians practicing at Futase Hospital, it seems likely that members of the Futase Hospital ethics committee had at least some clinical relationships with at least some of the coauthors of the papers by the researchers. In fact, in at least 6 studies (A9, A16, A17, A21, A27, A31), the chairperson of the ethics committee appeared to be involved with the conduct of the study as this person is reported to have performed the randomization and allocation of participants to treatment groups. Two issues arise from our analyses of distribution of p values and standardized sample means for considering the success or failure of randomization. There will be differences in p values and standardized sample means calculated from published summary data compared to values calculated from raw data because of rounding of variables. However, any differences would be small and could not explain the marked departure from the expected distributions that we found. A second issue is that some of the baseline variables may not be independent. For example, if by chance, one randomized group is older than the other, this group may have similar differences in variables correlated with age, such as bone mineral density. This could lead to clustering of p values and standardized means within an individual RCT. However, clustering may not occur in the same direction or magnitude in other trials. Since any differences between groups are attributed to chance, consistent clustering of variables should still produce an approximately uniform distribution of p values of between-groups comparisons from a group of clustered baseline variables across multiple trials. Therefore, clustering of results from individual RCTs is unlikely to affect the analysis of a body of RCTs markedly. However, results from individual RCTs or small differences from expected variations for a body of RCTs should be interpreted cautiously. Previously, Carlisle analyzed the distribution of standardized sample means from 168 RCTs published by an individual author, the integrity of whose work had been questioned, along with data from 366 RCTs from other authors.2 He reported that the observed distribution of standardized sample means for weight, height, and age from the 366 control RCTs were consistent with expected (range of standardized SD 0.93–1.06), whereas the distributions of sample means from the 168 RCTs of interest were not (range SD 0.55–0.62). Similarly, pooling all continuous variables produced a distribution similar to expected for the 366 RCTs from other authors, whereas the distribution was markedly different to expected for the variables from the 168 RCTs of interest.2 The results of our analyses of the data from the researchers were similar to the results of Carlisle's analysis, with observed distributions of sample means markedly different to expected. A limitation of this work, and the previous work by Carlisle, is that the statistical theory underpinning the methods used has not been fully developed. In summary, statistical techniques, such as those used in this report and similar approaches used previously by Carlisle,2 that involve comparisons of the observed distributions of baseline p values or baseline variables in RCTs with the expected distributions may be useful when considering or investigating the integrity of a group of RCTs. Mark Bolland: drafting/revising manuscript, study concept or design, analysis or interpretation of data, acquisition of data, statistical analysis. Alison Avenell: drafting/revising manuscript, study concept or design, analysis or interpretation of data. Greg Gamble: drafting/revising manuscript, study concept or design, analysis or interpretation of data, statistical analysis. Andrew Grey: drafting/revising manuscript, study concept or design, analysis or interpretation of data. Dr. Bolland has full responsibility for the data, the analyses and interpretation, and the conduct of the research, has full access to all of the data, and has the right to publish any and all data, separate and apart from the guidance of any sponsor. Funded by the Health Research Council of New Zealand. The Health Services Research Unit is core funded by the Chief Scientist Office of the Scottish Government Health and Social Care Directorate. Role of the funding source: the sponsors of the study had no role in design and conduct of the study; collection, management, analysis, and interpretation of the data; and preparation, review, or approval of the manuscript. The authors are grateful to Bill Gillespie (Hull York Medical School, UK), Lesley Gillespie (University of Otago, New Zealand), and David Torgerson (University of York, UK) for earlier discussions regarding these trials. The authors are also grateful for the assistance of Fiona Stewart (Information Specialist) and Mari Imamura (Research Fellow and native Japanese speaker) from the University of Aberdeen. The authors thank Doug Altman and anonymous referees for their comments on previous drafts of this report. Accepted in final form August 24, 2016.
. Lies, damn lies, and statistics. Anaesthesia 2012;67:455–456.
. The analysis of 168 randomised controlled trials to test data integrity. Anaesthesia 2012;67:521–537.
. Efficacy of methyprednisolone pulse therapy on neuroleptic malignant syndrome in Parkinson's disease. J Neurol Neurosurg Psychiatry 2004;75:510–511; author reply 511.
. Risedronate therapy for prevention of hip fracture after stroke in elderly women. Neurology 2005;65:1513–1514; author reply 1513–1514.
. Substandard studies or substandard “standard-of-care.” J Bone Miner Res 2006;21:491; author reply 492.
. Risedronate for the prevention of hip fractures: concern about validity of trials. Arch Intern Med 2007;167:513–514; author reply 514–515.
. Data extraction errors in meta-analyses that use standardized mean differences. JAMA 2007;298:430–437.
. Effect of calcium supplementation on bone loss in postmenopausal women. N Engl J Med 1993;328:460–464.
. Hydrochlorothiazide reduces loss of cortical bone in normal postmenopausal women: a randomized controlled trial. Am J Med 2000;109:362–370.
. Effects of a beta-blocker on bone turnover in normal postmenopausal women: a randomized controlled trial. J Clin Endocrinol Metab 2005;90:5212–5216.
. Randomized controlled trial of calcium in healthy older women. Am J Med 2006;119:777–785.
. Annual zoledronate increases bone density in highly active antiretroviral therapy-treated human immunodeficiency virus-infected men: a randomized controlled trial. J Clin Endocrinol Metab 2007;92:1283–1288.
. The peroxisome proliferator-activated receptor-gamma agonist rosiglitazone decreases bone formation and bone mineral density in healthy postmenopausal women: a randomized, controlled trial. J Clin Endocrinol Metab 2007;92:1305–1310.
. Addition of monofluorophosphate to estrogen therapy in postmenopausal osteoporosis: a randomized controlled trial. J Clin Endocrinol Metab 2007;92:2446–2452.
. Randomized controlled trial of calcium supplementation in healthy, nonosteoporotic, older men. Arch Intern Med 2008;168:2276–2282.
. The antiresorptive effects of a single dose of zoledronate persist for two years: a randomized, placebo-controlled trial in osteopenic postmenopausal women. J Clin Endocrinol Metab 2009;94:538–544.
. Low-dose zoledronate in osteopenic postmenopausal women: a randomized controlled trial. J Clin Endocrinol Metab 2012;97:286–292.
. Randomised controlled trial of vitamin D supplementation in sarcoidosis. BMJ Open 2013;3:e003562.
. Low-dose fluoride in postmenopausal women: a randomized controlled trial. J Clin Endocrinol Metab 2013;98:2301–2307.
. The skeletal effects of pioglitazone in type 2 diabetes or impaired glucose tolerance: a randomized controlled trial. Eur J Endocrinol 2014;170:257–264.
. Randomisation and baseline comparisons in clinical trials. Lancet 1990;335:149–153.
. How to randomise. BMJ 1999;319:703–704.
. Retraction: “amelioration of osteoporosis and hypovitaminosis D by sunlight exposure in hospitalized elderly women with Alzheimer's disease: a randomized controlled trial.” J Bone Miner Res 2015;30:2328.
. A systematic review and economic evaluation of alendronate, etidronate, risedronate, raloxifene and teriparatide for the prevention and treatment of postmenopausal osteoporosis. Health Technol Assess 2005;9:1–160.
. Etidronate for the primary and secondary prevention of osteoporotic fractures in postmenopausal women. Cochrane Database Syst Rev 2008:CD003376.
. Vitamin D and vitamin D analogues for preventing fractures associated with involutional and post-menopausal osteoporosis. Cochrane Database Syst Rev 2009:CD000227.
. Expression of Concern: Sato et al. Effect of folate and mecobalamin on hip fractures in patients with stroke: a randomized controlled trial. JAMA. 2005;293(9):1082–1088. JAMA 2015;313:1914.
. Amelioration of osteoporosis and hypovitaminosis D by sunlight exposure in hospitalized elderly women with Alzheimer's disease: a randomized controlled trial. J Bone Miner Res 2015;30:1745.
. Effect of vitamin K supplementation on bone loss in elderly men and women. J Clin Endocrinol Metab 2008;93:1217–1223.
. Vitamin K to prevent fractures in older women: systematic review and economic evaluation. Health Technol Assess 2009;13:iii–xi, 1–134. Author response to Betensky et al.